The biggest problem with viewing images on-line is the fact that everyone's monitor color and brightness reference is different. So, I've "acquired" (stolen from other peoples sites) some of the following images to help. The white image above is actually two colors. You should just barely see the difference between the left half and the right half. If you can't, adjust your contrast until you can. The black rectangle above should be two levels of black, again, just barely able to be seen as a difference between the left half and right half. If you can't, adjust the brightness control until you can. If you can't get it to be visible, try adjusting the contrast a bit again, and repeat. You should be able to find the combination where they both work. 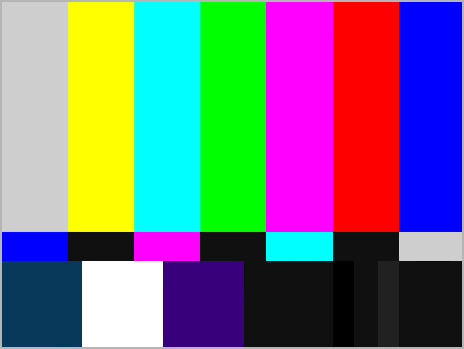 This is a standard color bar (often seen on TV stations as a holding pattern), and you should see reasonable colors from left to right: off-white,yellow, cyan (kinda light blueish), green, magenta (a kind of purpleish), red, and blue. The small bars in the middle are blue/black/magenta/cyan/black/off-white. For the bottom, the most imporant are the three skinny bars of black shades in the second from the right bar. You should see three distinct black bars. And finally, the bar above should be a nice even change from left to right, with no blocky transitions or sections.